It’s human to compare yourself with others. We compartmentalise and sort things into categories to make sense of the world. To make sense of ourselves and our lives, we often look to others and compare. We may draw a conclusion that we are failing, both as a person and in life. People tend to make Upward comparisons. They compare themselves with more successful, more outgoing people who seem to have it all. This social comparison puts us in a downward position. No wonder we feel bad! According to Social Comparison theory, it is common to compare yourself with others by using an Upward-Downward social comparison. An Upward comparison can be damaging to self-esteem. Why do we think it’s better to be in someone else’s shoes? Their shoes may not be the right fit or style, yet they seem ideal. What is your purpose in comparing yourself to others? If it allows you to see or experience something from someone else’s point of view, that is good for empathy. All too often though, wanting to be in someone else’s position can create envy and self-judgement. What’s good about comparing yourself to others? It all depends on what your intention is. If it’s to inspire you to greatness, or to do something you never thought you could do, then it could be worthwhile. It makes sense to compare yourself with others if you want to learn a new skill or improve the way you do something. You may need to model that on someone who is more proficient. If your intention is good, then it may help to compare yourself with others in some areas. What’s not so good about comparing yourself to others? Again, it depends on what your intentions are. Be clear about why you want to compare yourself with others. Try to be specific about which areas you are comparing. Decide on a realistic and representative sample, not just people in your own circle. You may run the risk of making comparisons on areas that aren’t important to you. For example, some people may value work status and progressing up the corporate ladder, others may value flexibility in their work lives. Just because you’ve made a different choice doesn’t mean that you’re better than or worse than anyone else. If your comparisons are made on societal or family expectations they may not be something you now aspire to. If they are made on your own expectations of achievements by certain age milestones, these may no longer be relevant to you. In NLP (Neuro-linguistic programming, an approach to communication, personal development, and psychotherapy) there is a saying that ‘the map is not the territory’ (Alfred Korzybski). We make a map in our minds of how we believe something to be, but it cannot fully replicate the reality of the territory. Think of it as a mud map drawn on a serviette out at dinner one night, that you later have trouble making full sense of. Think of it as an old map you’ve picked up of a destination you want to visit, only to discover that some of the streets are mislabelled. There may be new laneways or different proportions to your map. Our map of the world and how we fit may have some elements of an old map made in childhood or a map given to us by our parents. This map constantly needs updating to incorporate your changing view of the world, others and yourself. An old map is not going to get efficiently to where you want to be in life. When you compare yourself to others you probably filter for the things you believe to be true and then see those everywhere. For instance, if you believe that everyone your age has a baby by now, your day will be filled with noticing passing prams and pregnant woman. If you believe that everyone your age is in a stable relationship, you’ll see signs of that to confirm your opinion, making you feel worse about yourself and your life. The judgements are not going to be helpful in realistically evaluating what you want in life and going about achieving that, or to be happy with where you are in life. 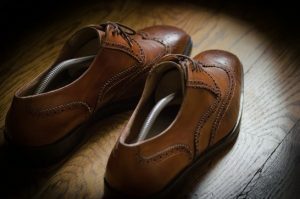 Let’s face it, sometimes you just need a new pair of shoes to give you a new perspective, or to go barefoot for a while. Who is your sample? Friendship groups or a narrow social circle may not be representative of people your age or stage in life. Or perhaps these things aren’t so important to you. What’s the purpose of making this comparison? (e.g. to help me…….) Why is it important to you to make this comparison with others? Is it a helpful or unhelpful comparison? Does it inspire you or give you a new learning focus, or does it send you into despair and doubt? Try to value your own personal attributes and achieving personal bests in the things you do. Contact Linda Magson, Sydney Life coach, for help to stop comparing yourself to others. Links to other articles by Linda Magson that may help you to stop comparing yourself with others. Follow this link for help to stop comparing yourself with others.